Planning a trip to the Maldives? Make sure you check this out. We all dream of traveling in search of surf in tropical, uncrowded waves. So what if you told you we knew somewhere where you could score one of the most consistent waves in the world without the hassle? Quite simply Hudhuranfushi Resort is the best place to be based for a surf trip in the Maldives. Lohis, the island left that is exclusive to Huduranfushi guests is one of the most consistent in the world. For 8 months of the year there is a ridable wave pretty much every day of the season. The island is positioned perfectly between the 2 other surf zones to the north and south, meaning it's a just a short dohni (boat) trip to Cokes/Chickens or Sutlans/Jails/Honkeys, not to mention the very mellow option of Ninjas just 5 minutes across the channel. Exclusive to our friends at World Surfaris, the surfers’s package ensures a maximum of only 35 surfers at one of the best surf resorts in the world. Managed by Wold Surfaris Maldives experts you’ll be able to surf Lohi’s without the hassle and get more waves for your money. Not to be forgotten are the six other world class waves in the region, including right-hand pits at Cokes or warm water Jbay at Jails, both within 20 minutes of the resort. 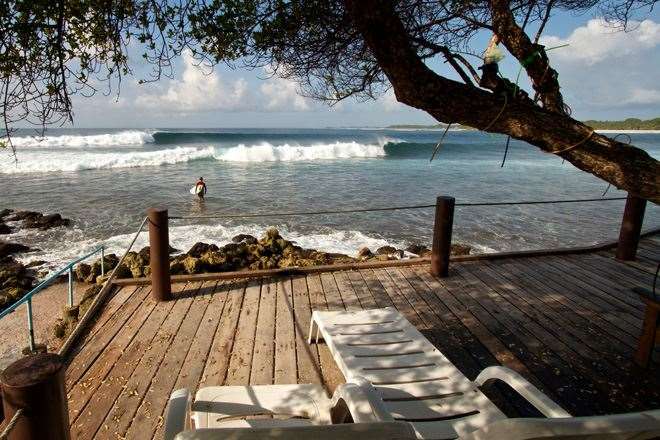 So if ever you want to surf perfect, uncrowded, waves in paradise, this is the time and the place! For more information and to book visit the World Surfaris website.